A new student group is coming to campus: the Boston University Coalition for Students with Disabilities is aiming to start up this semester. Sarah Hillesheim, a sophomore in the College of Engineering, decided to start the coalition as a way to bring the support she received at home to BU’s campus and to provide a platform to empower students with disabilities. While the coalition will be open to all students, regardless of whether or not they are disabled, Hillesheim said the group will work to include disabled students in leadership positions within the coalition. “BU CSD’s mission is to provide [a] disability community and promote accessibility on campus while asserting disability as a valuable component of BU’s diversity,” Hillesheim said. Some of the coalition’s long-term goals include implementing a freshman mentoring program in collaboration with the Office of Disability Services and incorporating issues of disability into mandatory staff sensitivity training. The group plans to promote representation for students with disabilities, both by providing panel representation at diversity-related events and by appointing student representatives to express the concerns of students with disabilities from within their colleges. The coalition also plans to host events such as biannual educational seminars or workshops on subjects like workplace rights for students with disabilities and annual seminars to increase awareness and inclusion of students with disabilities. 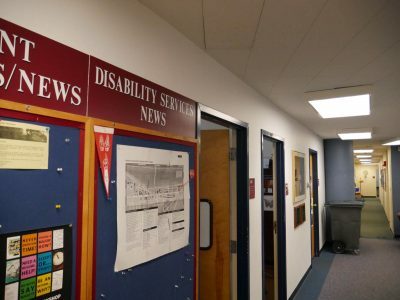 CSD will aim to “provide a face for disabled students to connect on campus,” Hillesheim said. CSD members will meet in the space dedicated to the Center for Gender, Sexuality and Activism (CGSA) located in the George Sherman Union. The reason behind meeting in the CGSA, Hillesheim said, is that it’s easier to schedule meetings as there is a set space they can use. The coalition currently does not have any members but is working on gauging interest from students through an online survey, created by Vice President Kallie Marske, as well to decide a meeting time. “[Marske]’s been really great,” Hillesheim said of the College of Communication senior. “She’s the one who’s been communicating with the CGSA to help find a meeting space, she’s been helping to write the constitution, recruit members, she made the Survey Monkey, etc.,” Hillesheim said. Director of the Office of Disability Services Lorraine Wolf would “be delighted” to work with the new coalition, as there hasn’t been such a club that she is aware of in her 22 years at BU. In the past, Wolf said, her office has worked with the Deaf Studies Club on campus as well as other groups, such as Hillel, that have asked for guidance on how to make their events more accessible to students with disabilities. About two-thirds of students with disabilities who attend four-year institutions do not graduate within eight years, a 2017 Hechinger Report study found. Researchers attributed this to a lack of “soft skills” education that teaches these students self-advocacy, time management and study skills. The Office of Disability Services, along with the Center for Psychiatric Rehabilitation and the Center for Anxiety and Related Disorders, seeks to teach students with disabilities those skills to ensure successful navigation through their college years. Day-to-day, the Office of Disability Services writes and enforces campus policies based on federal, state and local laws, provides resources such as sign language interpreters, accessible housing and classroom accommodations for students with disabilities and helps students develop self-advocacy skills such as how to negotiate with a professor. The Office of Disability Services works with about 1,000 students per semester, Wolf said. “We serve as a resource to faculty and administration on how to create accessibility on our campus, and from the student perspective, we’re here to make sure that students with disabilities have access to all of the programs and activities on campus,” she said.